Doctors around the nation are quietly frightened… even terrified… by a new threat, no one ever expected. It’s not a virus or bacteria. There’s no treatment, and certainly no cure. All most docs can do is pray. Heck, scientist still can’t figure out what it is… where it came from… and how it even happened. It’s a DEADLY new fungal infection. And even the CDC is downright petrified, with a leading government scientist issuing a warning from a real horror movie. And unfortunately for us, it’s NOT just hanging out near the lagoon. He warned that it’s ALREADY spreading, in the United States and around the world. Meaning you and your loved ones could be at risk right now and not even realize it. Not until it’s too late. 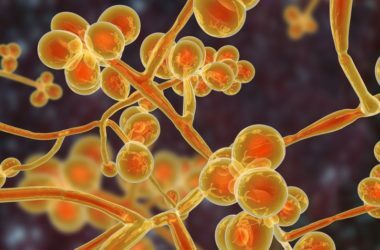 Researchers say fungal infections are becoming difficult and even impossible to treat. Much like bacteria evolving to beat antibiotics, funguses are changing to resist anti-fungal medications. And the transformation was swift. The worst of the lot is a germ called Candida auris that strikes older people with weakened immune systems. It’s so deadly that HALF of the people who get it are pushing up daisies within 90 days. That’s a 50 percent kill rate! And it spreads so quickly that when people are sick with it, entire wards have been shut down. A hospital in the UK had to close its entire ICU and transfer all of its patients to another unit. In a New York hospital, an entire room had to be taken apart from the ceiling to the floor and then rebuilt because of a single sick patient. But the horror story doesn’t end there. Even if the fungal infections don’t kill you, they could make your life a living nightmare. Other recent research has linked kissing-cousin fungus Candida albicans to the kind of memory problems and brain abnormalities seen with Alzheimer’s disease. And in an earlier study, fungal infections were found in 11 out of 12 brains of Alzheimer’s patients who had passed away. Given that drugs are rapidly failing, it’s absolutely essential to arm yourself against fungal infections right now. A good strategy today could save your life tomorrow, and you can begin by arming your body with good bugs to fight the bad: Take a probiotic. Specifically, take a probiotic with Lactobacillus. One of the first things most forms of Candida do is wipe out Lactobacillus. It’s as if it KNOWS it has to disarm this internal defense mechanism before it takes over. By bringing in regular Lactobacillus reinforcements, you’ll ensure your body has what it needs to fight back. And when you’re sick with a fungal infection, especially a minor one, don’t rush into treatment with the strongest anti-fungal drugs around. Just like with antibiotic resistance those could actually help set the stage for one of these new resistant funguses to take over. Instead, work with a naturopathic doc on nondrug options such as tea tree and oregano essential oils when they’re appropriate. PS: No matter what you’ve been told, Alzheimer’s disease, dementia, and cognitive decline are NOT a normal part of aging, and CAN be prevented—in some cases even reversed. And Healthier Talk Contributor Dr. Glen Rothfeld can show you EXACTLY how. He’ll walk you through the steps it in his easy-to-follow 3-Step Brain Resurrection Protocol. Ready to change your life… or the life of someone you love starting in just 48 hours? For ALL the details on this incredible breakthrough approach to preserving your precious memories CLICK HERE now.